Good morning! Welcome to Flawed yet Functional! Emily here, an adult-onset Type 1 Diabetic. 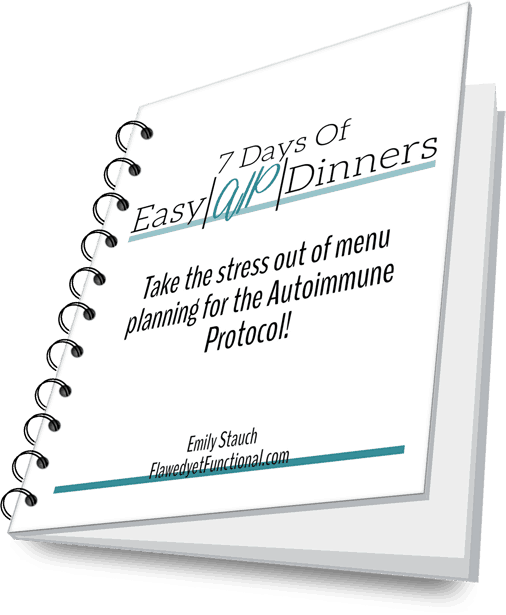 I have been using the Autoimmune Protocol to manage my blood sugar levels and overall health since February 2018. My diet currently includes several reintroductions (chocolate, seeds/nuts, wine, cashews) with the most recent being nightshades. Oh the joy of tomatoes and peppers! Today I’ve got another awesome, tasty recipe using chorizo (the first spicy meat we made after a successful nightshade reintroduction). Beef and Chorizo Paleo Taco Bowls with Easy Guacamole. I totally understand if you shudder at the thought of spicy food. Growing up, I never ventured further than chili powder as far as spicy things go! Then I married a Korean, and I learned the true meaning of spicy. I’ve had food so spicy (and temperature hot, which didn’t help) that I turned bright red and proceeded to have a ten minute coughing fit that I couldn’t control. Yeah, I could not stop coughing! Now that accommodations have been made, let’s jump into the details of this delicious meal! Pull guacamole and almond yogurt out of the fridge and serve! This meal is completely grain-free as I am still not eating any grains. I did test corn about 2 months ago, but something went haywire about two days afterward. The test was not as clean as it should have been, so I can’t say corn was a success or not. So…tacos without taco shells it is! Honestly, the sweetness of the potatoes compliments and tones down the spiciness of the meat. Even if you are still eating grains, you will thoroughly enjoy this Beef and Chorizo Paleo Taco Bowl! I kept the toppings fairly simple. For me, tacos get time consuming if you let the topping selection go overboard. That’s it. Sweet and simple. Enjoy the flavors of Mexican dishes while on the Paleo diet! Beef and Chorizo Paleo Taco Bowls are a tasty addition to your regular menu plan. Not only is it delicious the first night, but the leftovers make great lunches! Simply layer up a glass container with sweet potatoes, meat, cilantro, and onion when you finish up dinner, and your lunch is ready to go for tomorrow. Try this meal today! Spicy and hearty with the perfect blend of sweet and savory. This Paleo taco bowl is grain free and blends the flavors of Mexico perfectly with a gluten-free, dairy-free diet! Preheat oven to 450° and line a rimmed baking sheet with parchment paper. Prepare all the vegetables first to save time: peel and dice potatoes, chop both onions, and mince the cilantro. In a large mixing bowl, add the diced sweet potatoes, olive oil, sea salt (actual one I use, similar), garlic powder, oregano, cumin, and pepper. Stir to evenly coat. Pour onto prepared baking sheet and roast for 15 minutes. Stir after 15 minutes then return to oven to roast until soft, 15-20 more minutes. Once the sweet potatoes are in the oven, start the guacamole. Halve the avocado, remove the pit, then scoop the flesh into a small mixing bowl. Check out these instructions for the safest way to do this or use this tool! Use a fork to smash the avocado until mostly smooth with some small lumps. Add the 1/4 minced onion, garlic, sea salt, pepper, and lime to the avocado. Stir to incorporate then taste and adjust seasoning. On the stove-top, heat an enameled cast iron dutch oven over medium heat. Add the olive oil and onion. Saute the onion until softened and beginning to brown, stir as needed to prevent burning. Add all dried spices (chili powder, garlic powder, cumin, coriander, and oregano) and stir for about 30 seconds until fragrant. The best way to do this is to measure all the spices into a small bowl so they can be added at the same time to the onion mixture. Add chorizo and beef to the onion and spices, cook, breaking up meat with a wooden spoon, until browned and cooked through. Pour in tomato sauce and chicken broth. Bring to a simmer then reduce heat to low and allow to simmer softly until the potatoes are done. Add the lime juice. Taste and adjust seasoning. I usually add about 2 teaspoons of sea salt. To serve: Place potatoes in bottom of a bowl, top with taco meat, then add dairy-free yogurt, easy guacamole, cilantro, and fresh diced onion. Want to remember this? Pin Beef and Chorizo Paleo Taco Bowls with Easy Guacamole to your favorite Pinterest board!